​Save the date and be sure to attend the ABS inaugural First Friday at the Anchorage Museum! Visit with other ABS members in the Upper Atrium and shop their latest beaded art and jewelry. Get a head start on the holidays this year! General Admission is FREE on October 5. The theme of the event will be ALASKA! Do you have Alaska-inspired bead work like Alaska florals, wildlife, or landscapes? 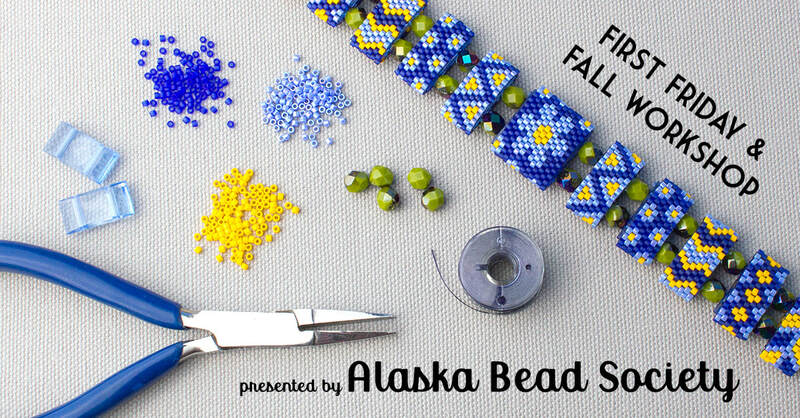 If so, wear them to this event and share YOUR story about your Alaska-inspired beadwork! Registration and Participation Fee ($40) are due September 15, 2018 (extended date). ​Space is limited! For questions, send an email to akbeadsociety@gci.net. If you are interested in a spot for this two day event, download the First Friday Guidelines and Registration form. Online payment is accepted here. ABS Fall Workshop – Make a Forget-Me-Not Carrier Bead Bracelet! Skill level: This workshop is designed for beginners, but individuals may independently create intermediate or advanced designs – Carrier Beads are versatile! Recommended for ages 12 and up. Workshop Fee covers admission to one workshop session and one bracelet kit.